Preheat oven to 425 degrees. Spread sweet potatoes and red onions onto a large baking sheet. Drizzle with about 1 tablespoon of olive oil. Season with salt, pepper, and turmeric toss to coat. Bake for 20-25 minutes, until the sweet potatoes are tender. Meanwhile, make chicken. Season chicken all over with salt, pepper, garlic powder and ground ginger. Add chicken to a heated grill and cook for 5-7 minutes pre side, or until cooked through. Let rest for 10 minutes, then cut each breast into 1" pieces. Make dressing. Whisk together garlic, soy sauce, peanut butter, honey, lime juice and siracha until evenly combined. Whisk in sesame oil and 1 tablespoon of olive oil until smooth. Divide rice between bowls. 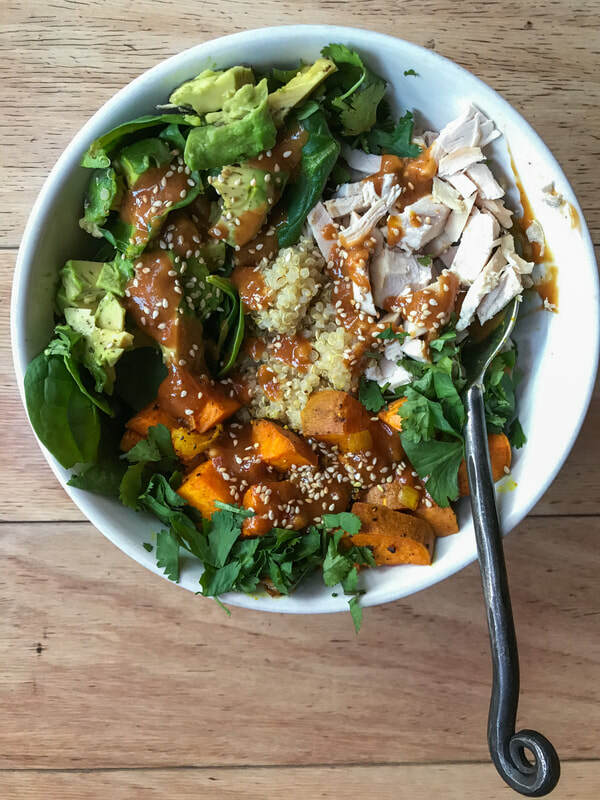 Top with sweet potatoes, chicken, avocado, baby spinach and mango if using. Sprinkle with cilantro and sesame seeds and drizzle dressing on top.